In the gallery of the newly-released Mega Man Legacy Collection 2, under the Mega Man 8 heading, is a piece of concept art that doesn’t look like it belongs. Update—It’s Mega Man 11, sneaky Capcom. 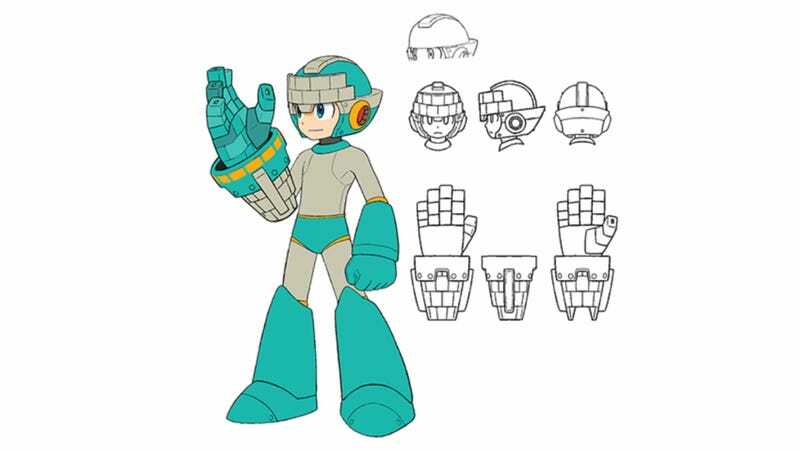 The art in question, seen above, depicts Mega Man in teal, grey and gold with what looks like a bit of stone wall protruding from the front of his helmet. The stone wall motif also carries to Mega Man’s right arm, replacing his traditional buster weapon. The image has fans confused, as evidenced by a rather lengthy Twitter thread started by Protodude (via Game Informer), steward of fansite Rockman Corner. For one thing, the image does not match any of the other concept art in the Mega Man 8 gallery. See the segmented feet? That sort of design didn’t come into play until Mega Man’s appearance in Super Smash Bros. for the Wii U/3DS. All of the other art in the gallery featuring Mega Man himself uses the creased boot style, seen in the image above. Fans of the series suggest this art was created digitally, unlike the rest of the concept art in the gallery. Furthermore, the consensus is that the style is that of artist Yuji Ishihara, who did the character design for the Mega Man Battle Network series and would not have been involved with Mega Man 8. In the beginning, I imagined a character like Mega Man equipped with some kind of weapon, but when you transformed, your whole appearance would change. You know that little protrusion on the top-front of Mega Man’s helmet? When you changed weapons, it was supposed to change like the Ninja Captor character’s helmets, and show a little symbol depending on the weapon’s element (fire, water, lightning, etc). Some fans think it was a mistake, much like Capcom leaving in the “Licensed By Nintendo” line in the collection’s version of Mega Man 7. Others are hopeful that it could be a secret hat tip to a new Mega Man game, but that seems unlikely as Capcom doesn’t announce new Mega Man games anymore. So not much help there. We’ll keep looking into the mystery of the seemingly misplaced Mega Man concept art, and will update the post if anyone ever figures this business out. Update 12/4/2017, 2:30PM: Today Capcom revealed Mega Man 11, featuring a familiar figure.